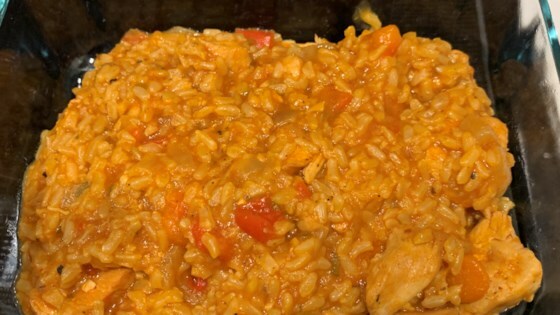 "This is the tastiest and easiest arroz con pollo you'll ever make! Try this great Latin-inspired chicken and rice that is full of color and flavor and can be made in minutes in your Instant Pot®." Turn on a multi-functional pressure cooker (such as Instant Pot(R)) and select Saute function. Heat 1 tablespoon olive oil and add cubed chicken; cook until golden, stirring constantly, about 3 minutes. Remove chicken from the pot. Heat remaining tablespoon olive oil and cook onion, red peppers, green peppers, garlic, salt, oregano, cumin, pepper, and red pepper flakes until tender, about 3 minutes. Place chicken back in the pot and stir in chicken broth, rice, and tomato sauce. Close and lock the lid. Select high pressure according to manufacturer's instructions; set timer for 35 minutes. Allow 10 to 15 minutes for pressure to build. Release pressure using the natural-release method according to manufacturer's instructions, about 10 minutes. Complete releasing pressure carefully using the quick-release method according to manufacturer's instructions, about 5 minutes. Unlock and remove the lid; stir in capers. Serve with cilantro and lemon wedges. Rice came out overcooked and gluey, and burned on the bottom. Followed recipe exactly. I used chicken legs because they were on sale, eliminated the capers.actually tasted better the day after. First time making this and it came out great! It was a family hit, will make it again!